- SS3s are easy to spam, turn off auto-approach to control range. Stun chance triggers after a set number of SS3s (usually 2 or 3). - SS3s are easy to spam, and can also damage enemies behind her. - Combo Partner: [Rain] - Increases damage by 5% vs Dark Element. 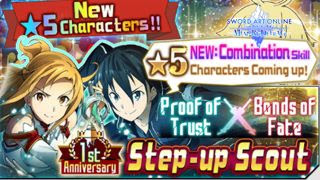 - Combo Partner: [Asuna] - Increases damage by 10% vs Dark Element. - SS3s are a bit hard to spam or use, ideal after parrying or while enemy is stunned. - SS3s can be easily spammed, just time it well. - SS3s are easy to spam, best with combinations. - Great burst damages, but hard to spam, so use after parrying or while the enemy is stunned. - SS3s has been upgraded heavily, and can now easily spammed. - SS3s can be used to dodge attacks while dealing damages, but lands at mid-ranged position, making it a bit awkward to spam. - Combo Partner: [Water Element] - Increases damage attained by 5% vs Fire Element. - SS3s are somewhat easy to spam, but watch out for incoming attacks. - SS3s must be used in range to sink all hits, avoid directly top and bottom of target. - Animation is too long to spam but still great to use after parry of while the enemy is stunned, to unleash high damages. - SS3s are easy to spam, just time well, best with combinations. - Combo Partner: [Yuuki] - Increases damage attained by 10%. - Combo Partner: [Wind Element] - Increases damage by 5% vs Earth Element. [Assist] Atk+ Buff. - SS3s are possible to spam, but best after parrying. - Combo Partner: [Dagger] - Increases damage by 5% vs Holy Element. - SS3s are easy spam, turn off auto-approach to control range if needed. - SS3s are easy to spam, turn off auto-approach to increase teleport range. - SS3s can be spammed easily, just time it well. - Combo Partner: [Dark Element] - Increases damage attained by 5% vs Holy Element. - SS3s can be spammed while relying on her frame locks. - SS3s are pretty easy to spam, just time it well. - SS3s are are easy to spam, best with combinations. - Combo Partner: [Holy Element] - Increases damage by 5% vs Dark Element. [Assist]: HP+. - Combo Partner: [Neutral Element] - Increases damage attained by 5% vs Neutral Element. - High burst damage, ideal as support nuker after parrying or while enemy is stunned. - SS3s are easy to spam from a ranged position, but watch out for auto-aim and dashing attacks. - Combo Partner: [Dual Blades] - Increases damage by 5% vs Earth Element. - SS3s are easy to spam and can be used to dodge most enemy attacks! - SS3s are pretty easy to spam, but watch out for incoming attacks. - SS3s are easy to spam from any location, but watch out for incoming enemy attacks. - Combo Partner: [Silica] - Increases damage attained by 10%. - SS3s are easy to spam, juts time it well. - Combo Partner: [Male] - Increases damage attained by 10%. - SS3s are pretty much on point, so use after parry, stun, or for combinations.